The Cessna 525 CitationJet is a twin-engined corporate jet aircraft produced by the US-American manufacturer Cessna Aircraft Company. At the NBAA Convention, the development of the six-seat Model 525 CitationJet was announced as a replacement for the model 500 Citation and Citation I. Basically an all new aircraft, the CitationJet used a modified version of the Citation's forward fuselage, but with a new supercritical laminar flow wing, and a new T-tail configured tailplane. It is powered by two Rolls-Royce Williams International FJ44 turbofans, and features EFIS avionics and single pilot certification. The CitationJet's fuselage is 27 cm shorter than the Citation I. On 29 April 1991, the CitationJet protototype N525CJ flew first's on 29 April 1991, followed by a second (preproduction) prototype on 20 November 1991. FAA certification for single-pilot operation was received 16 October 1992, and the first delivery toke place on 30 March 1993. Replacement Citation CJ1 announced at NBAA Convention 19 October 1998. The Cessna Citation CJ1 (also Model 525) was developed as an improved version of the original CitationJet. The CJ1 improved on the CitationJet by adding a more-modern EFIS avionics suite and a moderate increase in maximum takeoff weight. The first Citation CJ1 (N31CJ) was completed late 1999. FAA certification for the Citation CJ1 was received on 16 February 2000. The CJ1 has been replaced by the CJ1+, which shares the same airframe but has an additional updated avionics package, and FADEC to allow the engines to be controlled by computer rather than mechanical controls. The CJ1+ has a 45kg increased in gross weight and is 37km/h faster than the CJ1 at 12,500mtrs. Cessna switched to the up­graded CJ1+ at aircraft 525-0600. The Cessna 525 CJ1+ accomodate two crew and four passengers and is powered by two Williams International FJ44-1A turbofans. The ICAO code for this business jet is C525. Cessna only built 102 CJ1+ (s/n 525-0600 to -0701). On 13 June 2007, Cessna 525 CJ1+ c/n 525-0642 was registered as N466AE in the USA with Aircraft Guaranty Corp Trustee, Houston, TX. A trust is an Anglo-Saxon legal. The AGC Trustee's are “Insured fiduciaries". Legally there is no owner, but the Trustee became the owner. This construction is often used for enabling non-US Citizens to obtain "N” registration of aircraft with the U.S. Federal Aviation Administration (FAA) for aircraft operating principally outside the United States. On 9 November 2009, the N566AE was delivered to Sasset AG, Switzerland, still registered with Aircraft Guaranty Corp Trustee. On 4 December 2014, registration N466AE was cancelled as exported to Germany. On 14 December 2014, the 2007-built Cessna 525 CJ1+ was registered D-ICAO in Germany with Lothringen Aero Services and based at Augsburg. 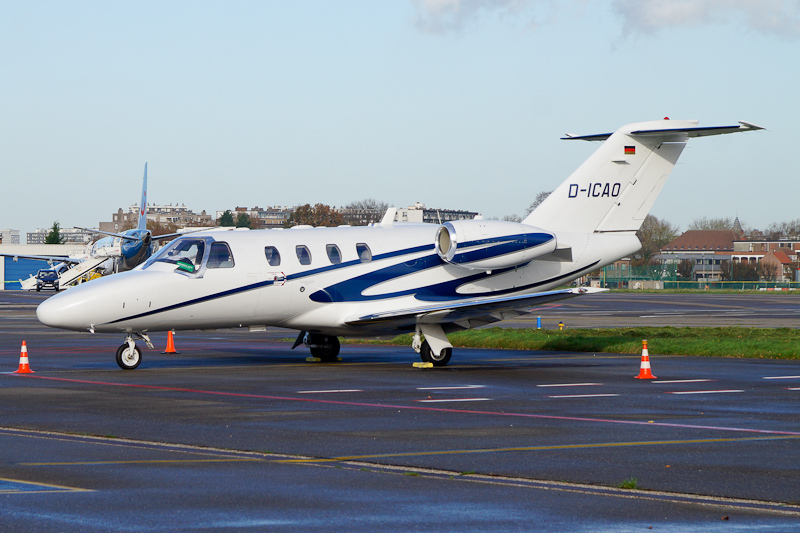 On 13 November 2015, Cessna 525 CJ1+ D-ICAO was seen at Antwerp Airport in Belgium.